Hi, I am interested in your 1968 Cadillac De Ville (stock #5029-CHA) listed on Autotrader for $16,995. I'd like to get more information about this vehicle and confirm its availability. Its time to think about all the different boulevards you know. 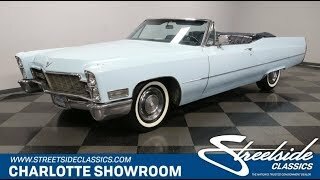 After all, this 1968 Cadillac DeVille is that perfect big V8 cruising droptop youve always wanted to show off, and at this affordable price, the dream has never been closer to a reality. Sporty, large, and elegant, Cadillac nailed its styling in 68. The upright headlights, upright taillights, and nothing but sharp creases in between made this top-of-the-line Caddy a commanding figure. The design would be softened a bit for 69, so we love this one for being one of the last truly imposing Cadillac droptops. Carolina Blue paint with a white soft top has a timeless look of elegance, and it has all the right jewelry to go with it. The brightwork is complete and shining, including the front bumper that contours with all the great curves; the rear one thats form-fitting to help create the hint of tailfin; and even the turbine-style factory wheel covers are still in place. While we love the look with the white roof in place, with the touch of a button, it folds down to revel something we love even better. After all, there is arguably nothing more attractive than a light blue exterior with a dark blue interior. The leather seats look great with the plush button-top presentation thats the perfect 60s premium appearance. And the front power adjusts to get you in that perfect driving position. With the driver-oriented dash, fold-down armrest, and three-spoke steering wheel, you get an individual level of comfort no matter how many people are enjoying this big Caddy with you. There are all the right period-correct premium features, including power windows, power locks, and provisions for factory air conditioning. Plus, theres an AM/FM/CD stereo with Bluetooth hidden in the glovebox. That way you can get the best in modern tunes without chaining the vintage atmosphere. Filling the engine bay is the monstrous 472 cubic-inch V8. With a four-barrel carburetor on top, this offers huge horsepower and torque. But while the figures are at muscle car levels, this one never loses its luxury composure. Instead, it utilizes its whooping torque to easily and confidently get you off the line. Plus, the big V8 makes sure youve always got power in reserve, even at highway speeds. There have even been the right quality investments in this car like an aluminum radiator, newer coil, and newer dual exhaust. Add in power steering, a three-speed automatic transmission, power brakes, and Cadillacs legendary ride, and you know this is how you want a classic cruiser to be. The sale comes complete with owners manual. With all the money you save, theres even room in the budget to take it to the next level. So dont let this classic Caddy slip away. Call now!